These stainless steel load cells are ideal for measuring in-line tension forces. Applications vary from cables on cranes, support rods in architectural designs, engine test beds, to industrial weighing applications. 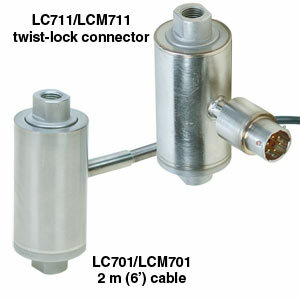 The LC701 Tension Link has a 6 ft. (2 m) cable while the LC711 has an integral MS style connector. The LC701 and LC711 are also available in metric configurations, with ranges from 0-50 to 0-1000 kgf and metric threads. Please see the LCM701 for complete details, or contact our Pressure department for more information. Nota: All LC701/LC711 series load cells include 5 point NIST traceable calibration certificate. Mating connector for LC711 sold separately, part number PT06F10-6S, $26.50.